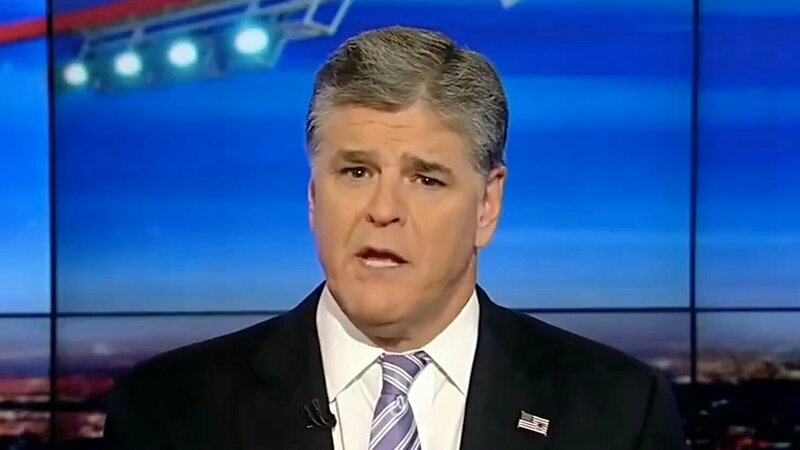 Fox News host Sean Hannity has launched an extraordinary attack on ‘President Trump, sorry I mean President Obama’, calling him ‘obviously sick, pathetic, and twisted in this obsession with President Obama, sorry I mean President Trump’. Hannity also claims that he recieves nightly phone calls from the White House during which ‘President Trump, sorry I mean Obama’ appears to be ‘either very drunk or on some sort of drugs’. He reports that the calls, which sometimes go on for several hours, reveal ‘Trump, sorry I mean Obama’ to be a man wracked with self-doubt, desperate for approbation, and, above all, profoundly out of his depth in his new role. Hannity stated that he is ‘worried’ for the president’s state of mental and physical heath, and pleaded with him to turn instead to a competent professional. ‘President Trump, sorry I mean Obama, you must stop calling me’, he pleaded directly to camera Thursday night. ‘I know you have an enormous amount to deal with right now, what with Mueller’s investigation about to knock on your door any second and the creeping suspicion that everyone in the world is looking at you and either laughing or crying with rage, incredulous that the American people could have entrusted the machinery of world government to someone so patently corrupt, obviously temperamentally unstable and catastrophically ignorant of the most basic aspects of what political power entails. But I have a family and a very high-pressure job. I need to sleep at night, not listen to the bitter, self-pitying, incoherent ramblings of an inebriated madman’. Hannity also explained that ‘President Trump, sorry, I mean President Obama’ has an abiding obsession, one which ‘seems to be consuming him from inside, like a particularly malevolent cancer’, with the notion that he is ‘not nearly as well-suited to the job as his predecessor, President Trump. Sorry, I mean Obama. No wait, Trump’. According to Hannity, ‘Trump’s, sorry I mean Obama’s’ entire political agenda, right from the moment he was inaugurated in January this year, from Climate Change to North Korea to the Middle East, has been determined by a pathological need to destroy and thus emulate the achievements of his widely-respected counterpart. His fixation on ‘President Obama’s, sorry I mean President Trump’s legacy’ is said to be such that he is unable to face up to basic facts about his own situation, automatically projecting every criticism that is made of him ‘directly back onto Obama. Sorry, I mean Trump’. Hannity claims that even those within ‘Obama’s, sorry Trump’s’ inner circle now instinctively copy this behavior, to the point that in any statement that emerges from the White House or is made by his supporters in the media ‘you might as well just replace the name Obama with Trump, and vice versa. That’s how insane things have become. It’s very confusing and frankly puerile’. Asked after the show to specify which media figures are guilty of such behavior, Hannity refused to comment, saying only that he ‘hoped that Melania, I mean Michelle, can hide the president’s iphone so I can get a good night’s sleep for a change’.